A land of rolling mountains, idyllic lakes and umpteen minority peoples, Shan State is by far the largest in Myanmar, and deservedly one of the most popular with travellers. In a giant place with only three major cities, it’s perhaps inevitable that the primary attractions are of the natural variety – Inle Lake is a swoon-worthy postcard picture come to life, and many of the independent travellers who visit do so at the end of a multi-day hike through fields and across gentle hills. The Intha people who live in stilt villages along its fringes have evolved a unique way of life, beautifully adapted to the seasonal ebb and flow of the shoreline, where slender-topped stupas overlook a mosaic of rice paddies and floating vegetable gardens. Each morning, a fleet of long-tailed motorboats skim across Inle’s glassy surface, ferrying visitors to monasteries and temples, and workshops where silk is handwoven from lotus fibre. The small town of Nyaungshwe is the de facto base for visitors to Inle Lake, whose waters begin just a few kilometres to the south. 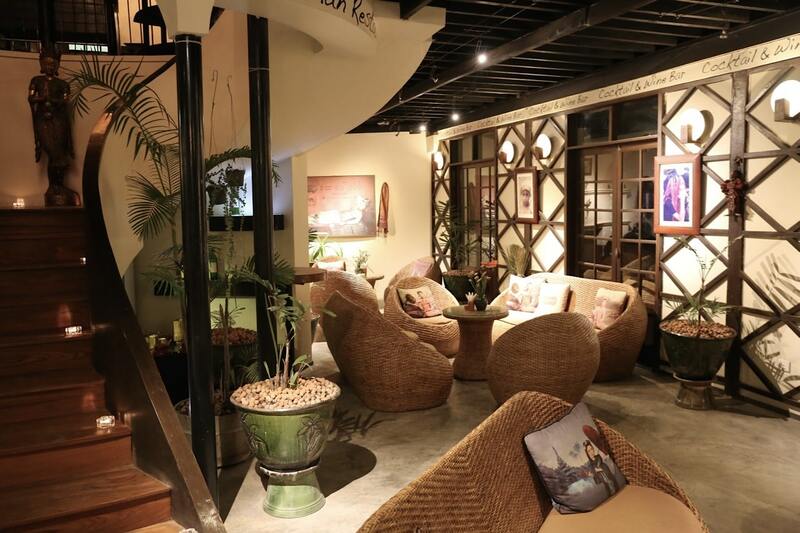 It’s one of Myanmar’s most pleasant places to stay – head to the bars or night market and you’ll meet travellers who arrived with the intent of staying one night, yet ended up basing themselves here for a week. Viewpoint Lodge sits perched over Nyaungshwe’s bustling canal. It’s the most luxurious hotel in town with an ideal address to boot. The property features 24 cottages which sit on stilts over a private lake. The hotel was built using traditional Shan construction techniques featuring local limestone, mud, rice straw, and wooden beams. If you’re feeling peckish head to the Viewpoint’s restaurant, the finest dining room in town. Sin Yaw Restaurant is the closest thing to an authentic Shan restaurant you’ll find in Nyaungshwe, run by a pleasant Shan-Chinese couple. Each evening the place gets packed with a line of hungry sunburnt faces patiently waiting for the next available seat. 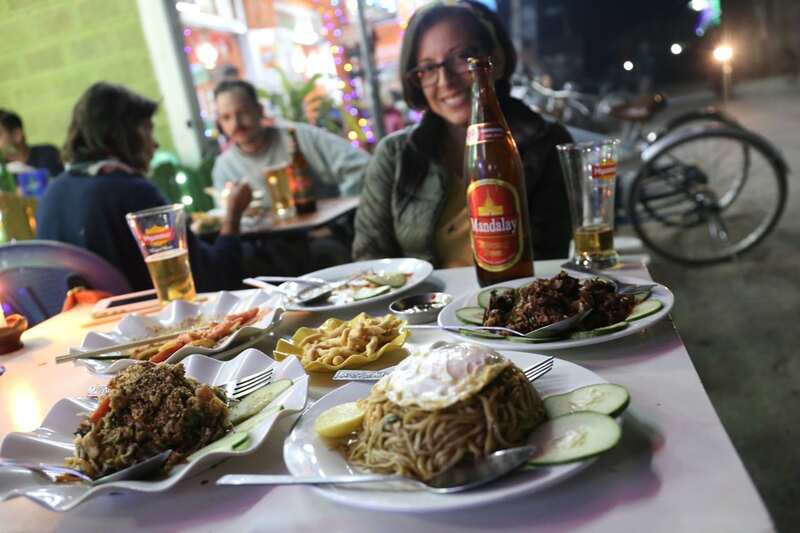 Prices are certainly reasonable – dinner for two (two beers and four dishes) was just $12. Be sure to order the crispy lemon tofu, fermented tea leaf salad and slippery Shan noodles. 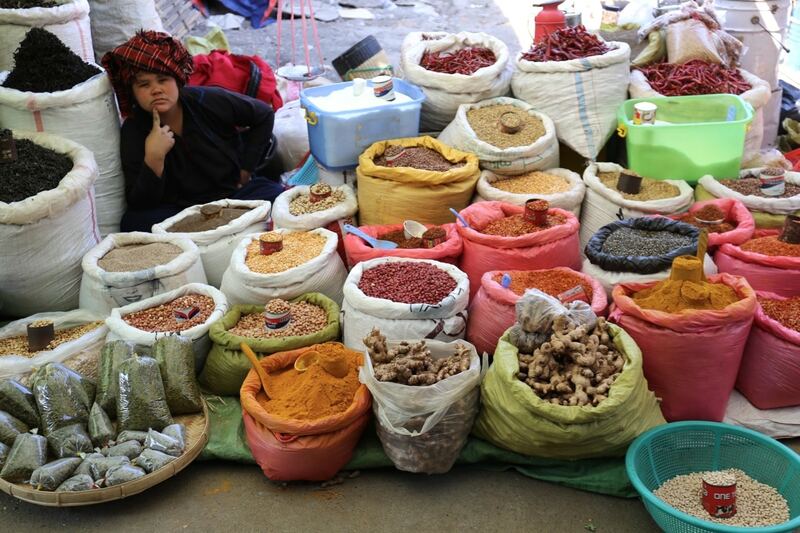 Mingalar Market is the town’s main source of fresh produce, sold by Pa-O and other ethnic minority villagers from the surrounding hills. Every five days, their ranks swell when the covered bazaar plays host to the area’s rotating market, worth catching in the early morning, when the air is filled with the aroma of cooking as stallholders prepare Shan noodle breakfasts for shoppers. 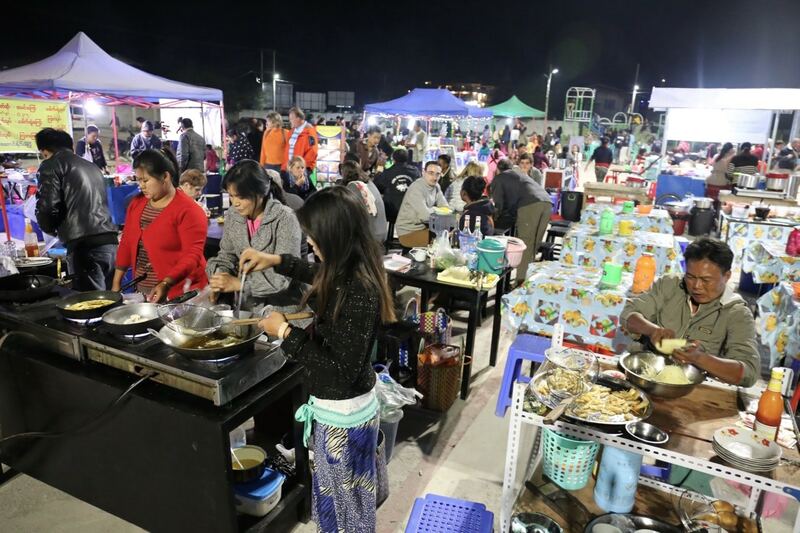 Nyaungshwe just recently launched a daily Night Market, located at the town’s sports field. In the park you’ll find local kids squealing on see-saws while their parents prepare sizzling dishes al fresco. It’s the best place in town to people watch and offers a great opportunity to mingle with locals who come to here to squat on plastic chairs and enjoy a cheap feast. 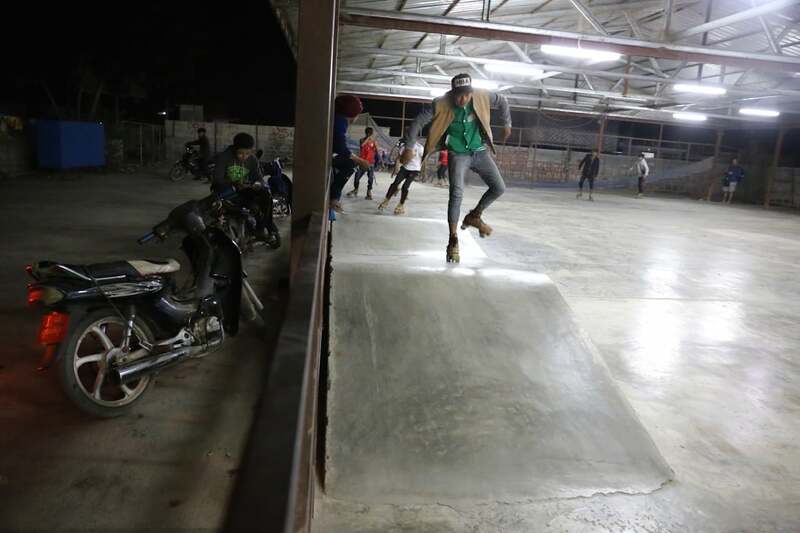 If you’re in town on a weekend head to the old school Roller Rink located a stones throw from the market. The cool kids lace up rollers skates and twirl together as a DJ blasts pop beats. 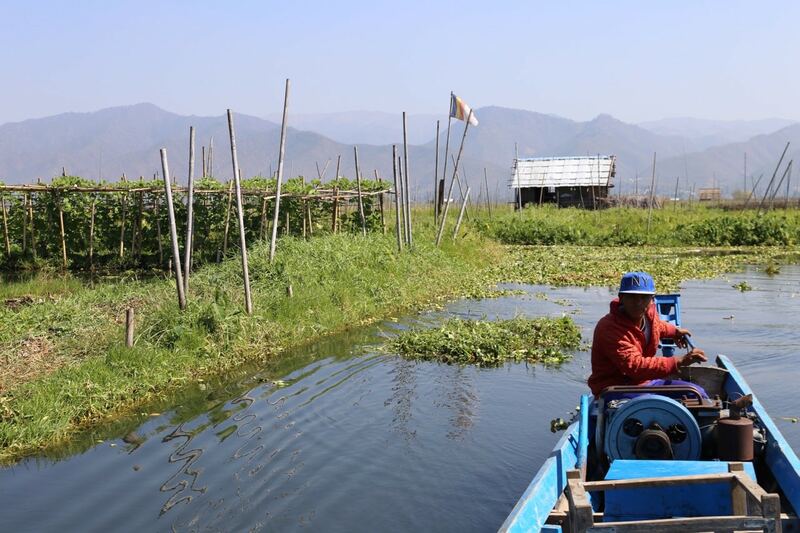 You can easily book a tour of Inle Lake at the canal (directly across from Viewpoint Lodge). The current rate for a private six hour boat cruise is $15. The region’s iconic longboats are are surprisingly comfortable, featuring a soft cushion topped chair, lifejacket, warm blanket and umbrella. The Intha settled in the region in the 19th century, fleeing invasions by their Thai neighbours across the border. 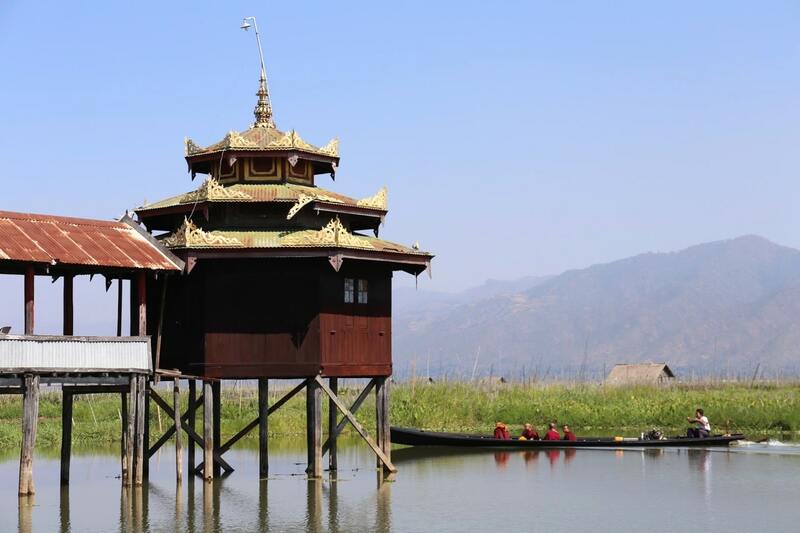 It is said that that local Shan chief refused to grant them rights to land around Inle, which is allegedly why the Intha built their stilt houses on the fluctuating waterline of the lake itself. 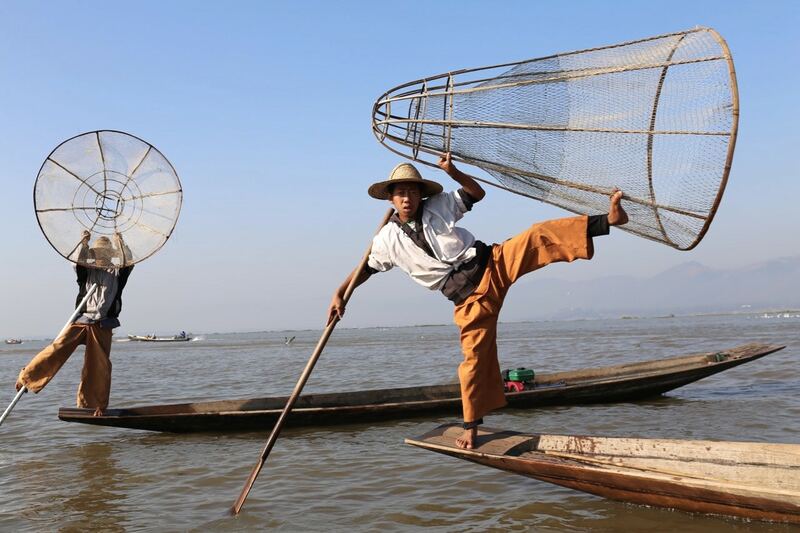 Inle Lake’s Fishermen are perhaps the regions most famous icons. Known as expert gymnasts and paddlers – famous for their distinctive one-legged rowing style. After puttering through a picturesque stilt village we hopped out of our boat and enjoyed a tour through a Silk Weaving Factory. 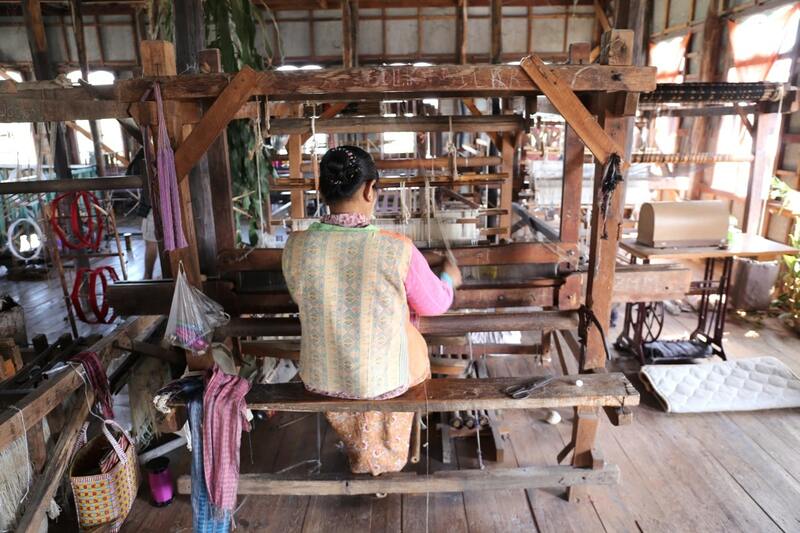 The two-storey building was bustling as local woman worked their magic on old school looms, weaving beautiful silk into fabulous fabric. Phaung Daw U Pagoda is Inle Lake’s main shrine which holds five Buddhas that are now unrecognizable under innumerable layers of lumpy gold leaf. The Golden Bird Festival (September/October) is Inle Lake’s most important religious festival. 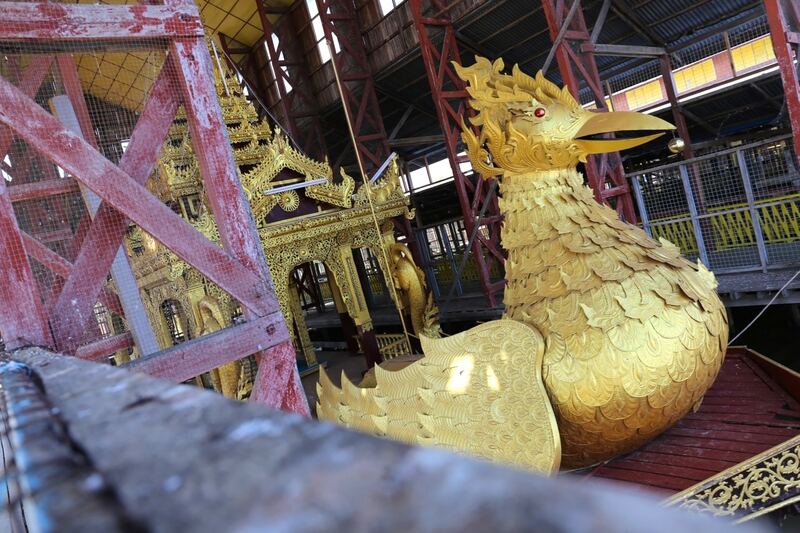 Four of the Phaung Daw U Pagoda’s five amorphous, gold-encrusted Buddhas are paddled around the villages in a ceremonial hamsa bird barge, pulled by teams of leg rowers in matching costumes. 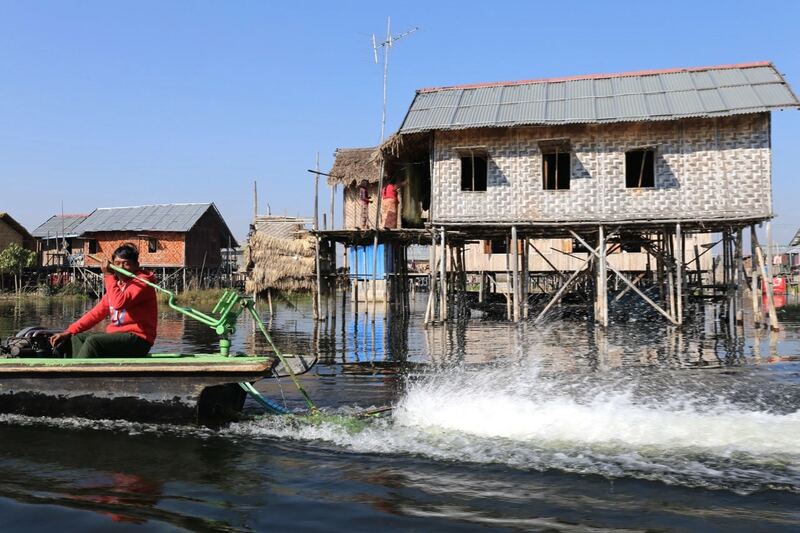 Ywama is the most picturesque of Inle Lake’s stilt communities. Nearly all the homes and buildings are constructed on piles driven into the lake bed. 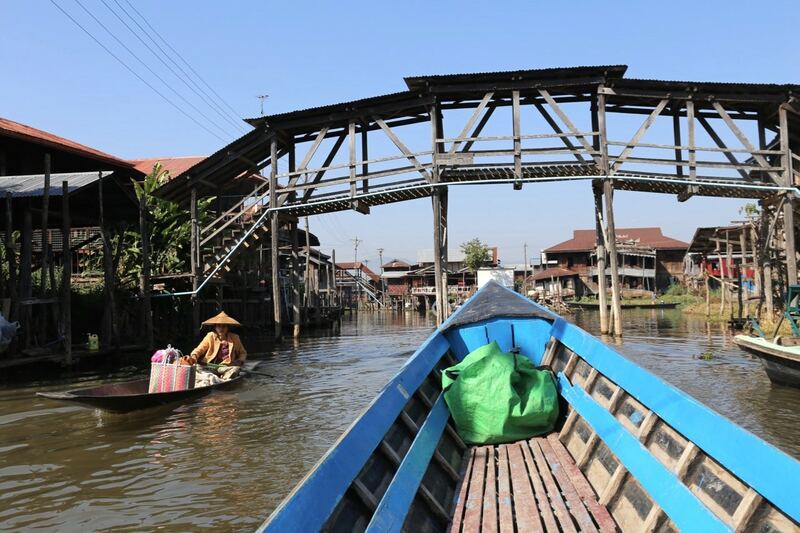 Residents travel around by canoe, but there are also numerous bamboo walkways and bridges over the canals. Camera fans will adore the photo ops here, with the best view enjoyed from a covered bridge which overlooks a string of river perched pagodas. 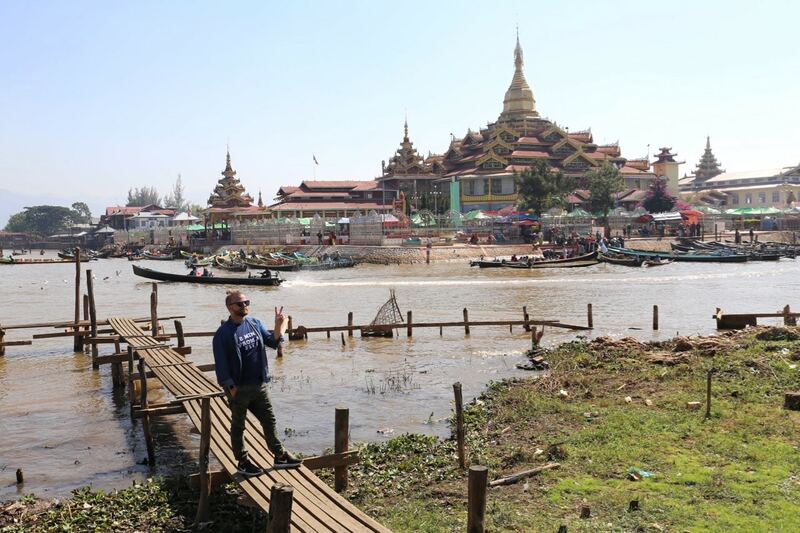 The Intha are famous for their amazingly productive vegetable beds, these Floating Gardens are made by piling weeds and compost on long poles fixed to the lake floor. Arrive in the morning and you’ll spot women in canoes plucking from tomato and squash plants, before paddling their harvest home. 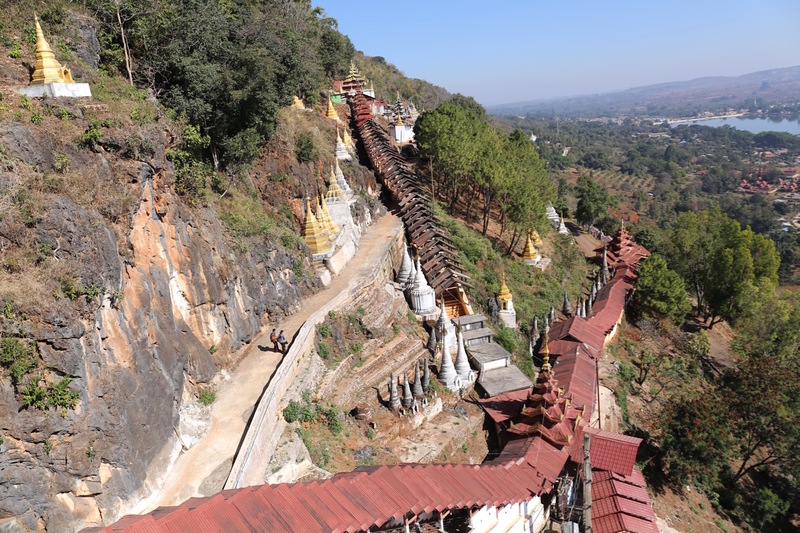 Npa Phe Kyaung was long famed as the jumping cat monastery. While the monks no longer prompt resident felines to jump through hoops, the beautiful wooden meditation hall is worth exploring. 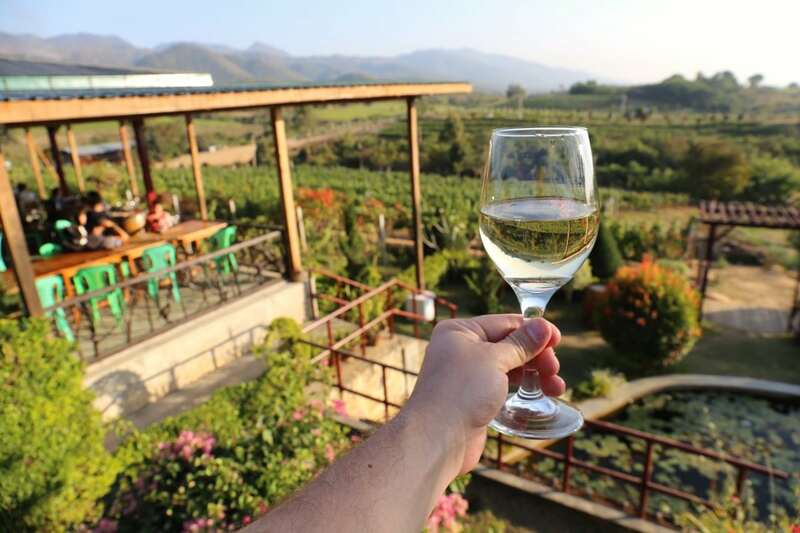 On the outskirts of Nyaunghswe, Red Mountain Estate was set up in 2003 and comprises two separate estates where a team led by a French winemaker produces New World-style vintages, from Shiraz-Tempranillo and Pinto Noir to Sauvignon Blanc and Chardonnay. While the wine is nothing to write home about, the winery itself is located on a jaw-dropping hillside. Be sure to arrive an hour before sunset to sip a glass of rose (the most quaffable of their bottles) as hoards of tourists sit back to watch the jaw-dropping sunset. 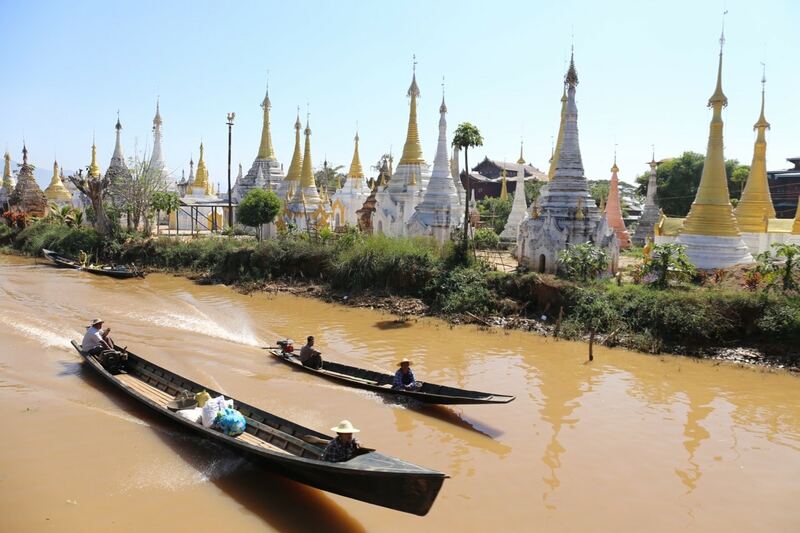 A popular day trip from Inle, Pindaya is a complex of three caverns honeycombing the flanks of a steep hillside. The largest of them, extending 150m into the rock, has become a major Buddhist pilgrimage site due to the 8,000 gilded Konbaung-era Buddhas inside. Dating to the late 1700s, they come in a variety of sizes and styles, but it is the ensemble that makes the real impact. 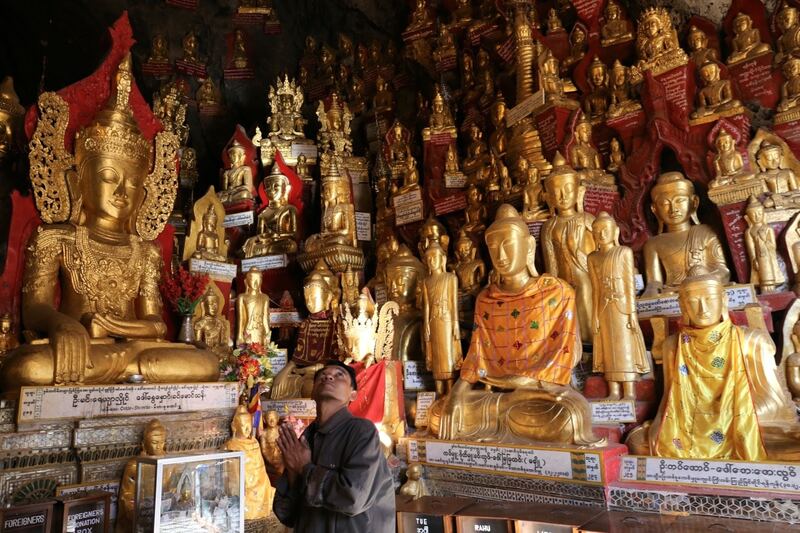 After a stiff walk up the 200-step pathway, or via the road and elevator, the sight of the golden statues vividly illuminated against the stalactite-encrusted ceiling and rock walls is one few visitors forget. Inle Lake is indeed one of the most magical places I’ve ever experienced. I was there for the festival and it was astounding. However, I didn’t make it to the wineries or Pindaya, so I’ll have to go back. Preferably ASAP. 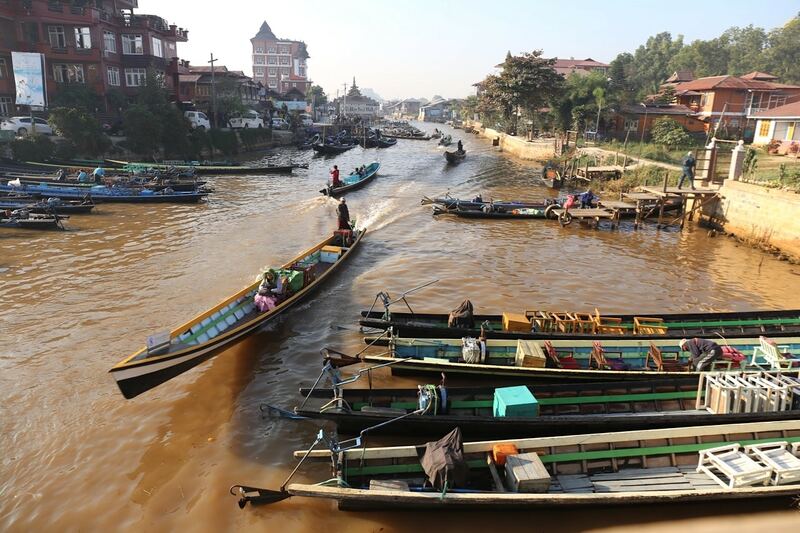 Inle Lake looks like an incredible place in Myanmar. I heard about wonderful Phaung Daw Oo Pagoda Festival. I am living currently in Myanmar and working with Venari Consulting Services so I would like to visit this Festival. I heard it is an magnificent festival.